Cave Point is a popular destination for photography buffs in winter, but the ice-covered rocks make footing dangerous. Photo submitted by Jason Fish. UPDATED FEB. 12, 4:07 pm: The Door County Sheriff’s Department has identified the man reported missing Sunday at Cave Point County Park as Eric Richter. A 57 year-old Neenah man has been reported missing after taking photos at Cave Point County Park Sunday. According to a press release from the Door County Sheriff’s Department, a man contacted his wife at around 5 pm Sunday to tell her that he was taking photos at Cave Point. At 9:16 pm the Door County Sheriff’s Office received a call that the man had not yet returned to his home in Neenah. Deputies were dispatched to the area and located the subject’s vehicle in a parking lot at the park at 9:43 pm. Deputies conducted a foot search of the park and located some property that they believed belonged to the subject near a cliff along the shore. 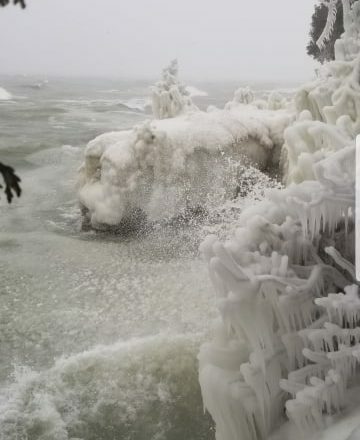 Conditions at the time were reported to include 7 to 8-foot waves on Lake Michigan and the cliff along the shore was reported to be ice-covered and dangerous. The Sturgeon Bay Fire Department and U.S. Coast Guard were contacted for assistance. A more extensive ground search was conducted by the fire department. The Coast Guard dispatched a helicopter and boat and conducted a water search of the area. The Coast Guard suspended their search at 1:30 am on Monday, Feb. 11. The Sheriff’s Department said search efforts are continuing and are hampered by hazardous conditions on Lake Michigan. Foul play is not suspected. The subject’s name is not being released at this time.